Don’t let the name of Joye Cottage fool you; this Aiken manse is the largest private home in South Carolina. The home was originally built as a farmhouse in the 1830s and was remodeled as a Winter Colony retreat sometime around 1897. It possesses strong artistic ties that promise an enriching future while claiming an intriguing past. Whitney hired noted New York architect George H. Freeman to renovate the original Georgian structure in 1897, now a hodgepodge of architectural styles ranging from Queen Anne to Beaux Arts and incorporating both Roman and Greek Classical Revival. It was reputed to be a retreat where Whitney and his friend, the recently-widowed Edith Randolph, could escape together. The two married shortly after their first getaway to Joye Cottage, but in 1898 Edith Randolph Whitney broke her neck, became paralyzed, and later died as the result of a riding accident on the estate. Though Whitney died in 1904, the property remained in the hands of the Whitney dynasty for decades, with the most notable owners being famous polo player Harry Payne Whitney and his wife, sculptress Gertrude Vanderbilt Whitney, founder of the Whitney Museum of Art in New York. Through the years the home fell into disrepair, and it eventually left the Whitney family in 1980. In 1989, Pulitzer Prize-winning biographers Steven Naifeh and Gregory White Smith became captivated by an ad in a real estate brochure and bought the property, forever changing its purpose to a nucleus for the arts. Naifeh and Smith, whose biography of Jackson Pollock was made into the award-winning film Pollock, documented their struggles renovating Joye Cottage in the book, On a Street Called Easy, In a Cottage Called Joye. Being supporters of the arts, they have bequeathed the property to the Julliard School in New York while also creating Julliard in Aiken, a week-long arts festival held in March of each year, beginning in 2009. Sadly, Smith died of a brain tumor in April 10, 2014. Listen to owner Gregory Smith discuss Joye Cottage with SCETV. Joye Cottage, the greater portion of which dates from 1897, is a rambling weatherboard Georgian Revival residence, consisting of a central block with four radiating wings. 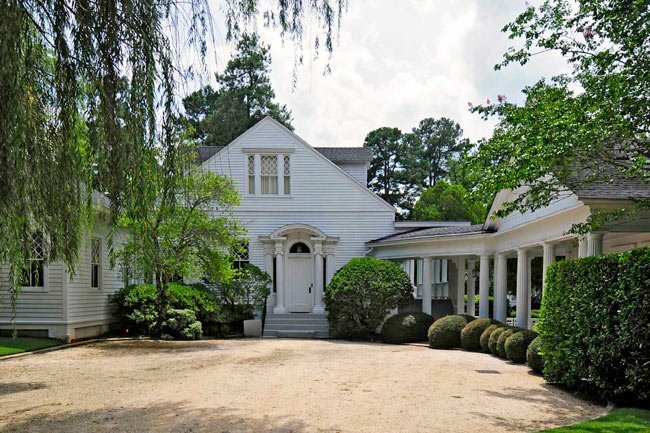 Joye Cottage is one of the oldest and largest of Aiken’s winter retreats for the wealthy. It is also important as a relatively intact example of the architecture expressive of the lavish scale of living practiced in Aiken’s Winter Colony. The cottage building represents the extensive remodeling of an existing building done ca. 1897 by New York architect George A. Freeman for William C. Whitney. Significant aspects include the arrangement of the wings to create a formal courtyard, the use of the Roman Temple form in the western wings, and the interior woodwork, including the wainscoting, the pilasters and columns, the staircase, and the mantels, all executed in the Georgian Revival style. William Whitney, who is considered the real founder of the Whitney dynasty, first joined the ranks of the winter colonists at the urging of Aiken pioneers Thomas and Lulie Hitchcock. Finding the sporting life in Aiken much to his liking, he became a regular winter resident. In 1897, he purchased Mrs. Joye’s boarding house from Miss Celestine Eustis and established himself as a permanent and influential member of the Aiken resort community. The nominated property includes the main house, the one and one-half story Whitney Stable and the two-story Whitney Squash Court. The Squash Court is significant as an early example of the Prairie style in South Carolina. Other outbuildings on the property include a greenhouse, a laundry house and two small one-story frame cottages. Many thanks to Bill Fitzpatrick of Taylors for sharing this shot. Bill enjoys the singular distinction of being the only person ever to have visited all 1,400 of South Carolina’s National Historic Landmarks. He has published several helpful e-books which serve as invaluable travel guides to the Palmetto State. If Mr. Naifeh would consider opening his private home for tours with a donation made to his favorite charity, I’d be in line waiting! I would like to talk to Kenneth Clifford about his grandfather. My great-grandfather was W.C. Whitney’s stable manager. I have a picture of him standing in front of the stable with grooms & hack driver, and we believe it was made before the turn of the century. My grandfather was the caretaker for many years. Mrs. Miller was the owner at that time. I spent many hours in the house. My grandfather lived in one of the cottages on the property. My family has pieces of furniture and I own a picture of a black man that worked for Mr. Whitney as a trainer of horses. Does anyone from the Macculloch-Miller family ever visit? Hello, my name is Tiffany. I’m getting married, and I love your place. I’m looking to see if you’re available and what price it would cost next September 19, 2015. Please contact me back. Thanks so much!